specialist thermal barrier technology, insulating heat within the exhaust preventing it from spreading to sensitive areas of the bike, whilst lowering surface temperatures to assist in reducing the risk of burns for riders and pillion passengers. Unlike car exhausts, the pipes and manifolds on bikes are far more exposed to the elements. This means the surface metal of the exhaust system must endure different weather conditions, stone chips and other abrasive material kicked up from roads, ultraviolet light from direct sunlight, and physical contact from riders and pillion passengers. 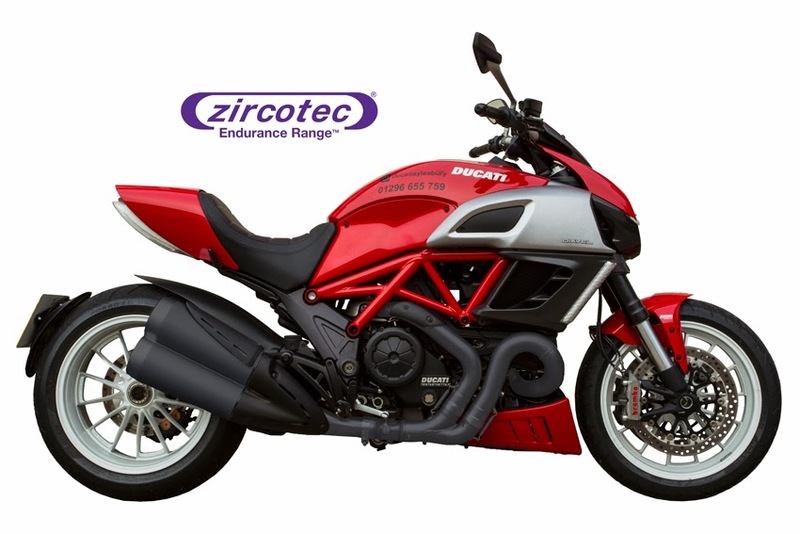 As a derivative of its proven and popular automotive Performance Range, the new smoother coatings are applied using Zircotec's proprietary plasma-sprayed process to deliver a well-adhered thermal barrier that outlasts conventional OEM and aftermarket paints. By retaining the thermal protection of its predecessors, the Endurance Range reduces the surface temperature of the exhaust system helping to save riders from accidentally burning their legs on hot metal when dismounting. Keeping heat insulated within the manifold also helps to minimise high temperatures from affecting the reliability of nearby heat-sensitive components. The net result is a range of coatings that present motorcycle riders with a new form of low-maintenance customisation that also prevents components and accessories, such as panniers, from heat soak and damage. Thousands of miles of rigorous real-world testing across Europe, exposed Endurance Range equipped bikes to mud, rain and tough terrain; yet the coatings emerged with no unsightly chips, flaking or abrasions. A quick power wash removed any mud caked on the bikes and brought the coatings back to their original appearance. "We are very proud of the durability of the Endurance Range, coupled with the heat protection the coatings provide," said Peter Whyman, Sales and Marketing Director at Zircotec. "Motorbike enthusiasts, especially those with touring bikes, can often put their machines through some very tough conditions that can result in unsightly corrosion and damage to exhaust systems. Heat radiated from hot exhausts also brings issues, such as heat soak, into the mix; simply put, our new coatings solve these problems." The Endurance Range is currently available in three colours - endurance black (matt black finish), endurance metallic black (incorporates a metallic fleck), endurance graphite (matt grey finish).